This portrait is part of the USAID Vietnam Clean Energy Program’s series on women champions in the Vietnamese construction sector, featuring women who have made strides in this male-dominated field, coming from diverse backgrounds and with different interests, but bound together by the common themes of a strong work ethic, love of country, a strong belief in themselves and a passion for their work. In a world of suits and trousers and mute-colored shirts, Ms. Nguyen Thi Hong Khanh stands out, not just for her femininity and bright-colored fashionable ensemble, but for in her accomplishments as a construction professional. The young woman is the vice head of the Water Management Division of the Ministry of Construction’s Administration of Technical Infrastructure. 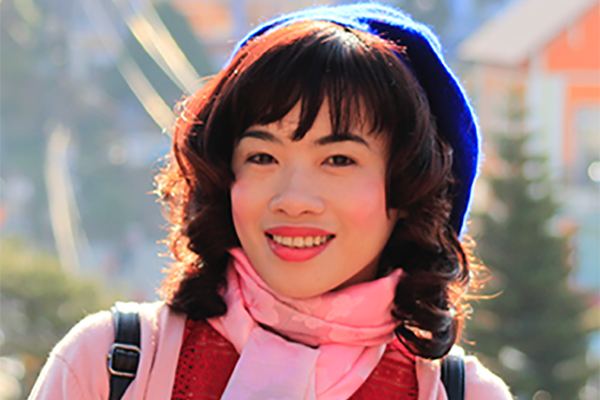 She manages water supply systems in urban areas and recommends adjustments to policies to improve water delivery, quality and reliability in Vietnam. 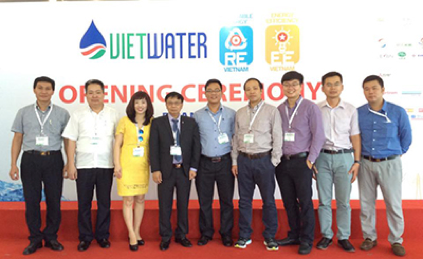 Currently, Vietnam’s rapid urbanization has increased the demand for a clean water supply. By the end of 2015, the country’s water supply capacity could only serve 79 percent of the total urban population with the ratio of water loss or non-revenue water (produced water that does not reach customers due to leaks or theft) of 26 to 30 percent of the total clean water production. The government of Vietnam is now looking to further reduce the rate down to 25 percent, in order to meet the increased demand for clean water. Ms. Nguyen said she and her colleagues are all aware that Vietnam is one of the countries which have been most seriously affected by climate change. That’s why both her individual tasks and her administration’s work aim to minimize CO2 emissions. “We are setting current and future targets to reduce CO2 emissions. All our work leads to green growth in the sector,” she said. 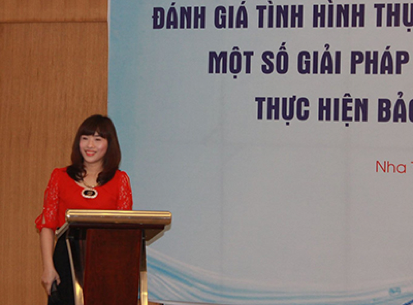 Ms. Nguyen at a workshop on the supply of safe water in Nha Trang town in June 2015. In early 2016, Ms. Nguyen worked with the USAID Vietnam Clean Energy Program to develop the construction sector’s Green Growth Action Plan (GGAP) with an emphasis on urban infrastructure. Leading her team, she proposed 20 priorities to promote green growth in the urban infrastructure sector. Some of her recommendations are to improve regulations and technologies, build capacity, and promote awareness of issues affecting water supply and security. “The recommendations aim to reduce CO2 emission in my sector in order to meet the ministry’s goals and GGAP targets,” she added. According to Ms. Nguyen, the USAID-funded Vietnam Clean Energy Program plays an important role in providing technical assistance for the ministry’s GGAP formulation, which will be submitted to the government for approval in 2017. “The program is working with different departments and agencies to help the ministry with a vision, goal and recommendations for reducing CO2 emissions in the construction sector. I hope the program will be able to publically share its findings and recommendations for all technical divisions under the ministry,” she said. Ms. Nguyen realizes that her sector is facing challenges, such as poor cooperation among agencies at different levels, low quality of services and incomplete strategies. However, she also realizes that the management of water supply, drainage, solid waste and traffic is becoming a major interest in Vietnam. “The sector will improve in Vietnam as both the government and donors have been paying special attention to these areas for the past few years,” she said. Ms. Nguyen confesses that it wasn’t easy for her to hold a leading position in the construction sector. She remembers facing many difficulties at first. Her male equivalents would easily discuss work issues with male subordinates at informal meetings outside the office, but as a woman, she often went back home after work to attend to her family. She devoted extra time to education and learning to better master her work. She also supports and mentors other staff, promoting improved relations and teamwork in her professional network as a key to her success. “I now think I have advantages over other male leaders. As a woman, I feel I’m both flexible and affable when working with my teammates. I’m devoted to my work and willing to help them,” she said. 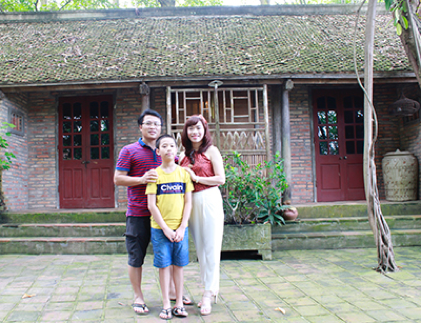 Ms. Nguyen worked as an assistant lecturer in the Hanoi University of Water Resources after she graduated in 2003. She moved to the Ministry of Construction in 2008 and was promoted to vice head of the Water Management Division in 2014. Ms. Nguyen is considered a young role model who will surely develop and flourish to become a leader in the sector, as well as inspire other women to make a difference in their country.